In San Diego it's known as the Silver Strand, a coastal bike path between San Diego Bay & the Pacific Ocean. It's a sliver of sandbar that connect Imperial Beach to Coronado Island, which I guess isn't an island after all, it's a peninsula! There is rumored to be a sunk ship that you can see during extremely low tides. The campground is right on the beach and popular among the RV crowd. The Hotel del Coronado is just down the street, downtown San Diego is close by & the laid back beach community of IB is a few miles south, bordering Tijuana Mexico. 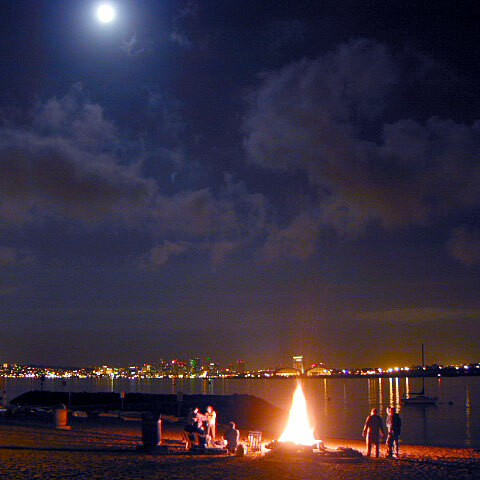 This is only real beach camping in San Diego downtown area, so camping reservations are highly recommended for Silver Strand Campground. Where are the Redwood Forests? California has many redwood forests - big, old, super tall trees. 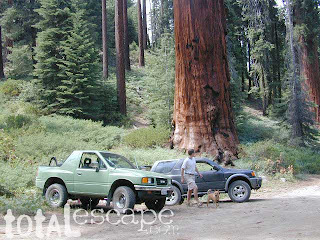 From the North Coast to the Southern Sierra Nevada 's these are the tallest & largest living things on earth. Not to be confused with the oldest living things on the planet, which are called Ancient Bristlecone Pines, also located in California, along the Eastern borders in the White Mountains, north of the Inyo mountains. 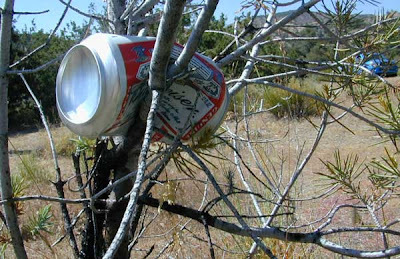 Plentiful camping all around these groves too. 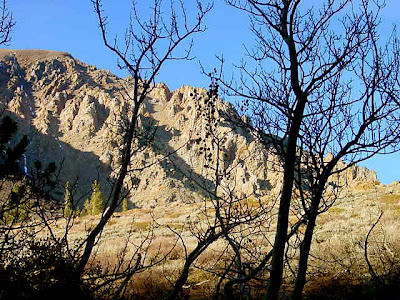 Mountain Home State Forest is a hidden park in the southern Sierra Nevada. 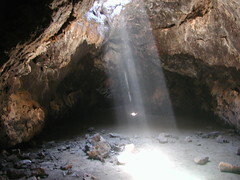 Yosemite has several ancient groves. 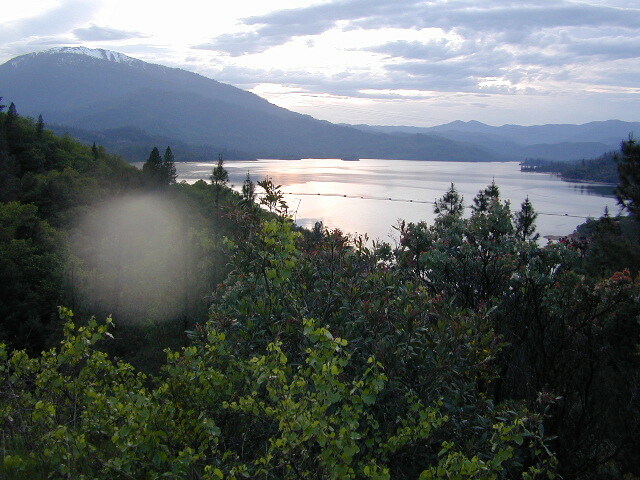 Bass Lake region has a small stand of Sequoias called Nelder Grove. 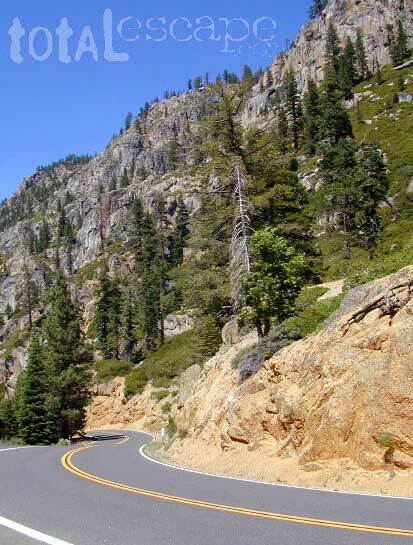 Giant Sequoia National Monument near Ponderosa even has some ob the dirt back roads, If you wanna discover all of California's big trees, check out our list of California Redwood Groves. The Gualala River meets the Pacific Ocean on the North Coast of California. 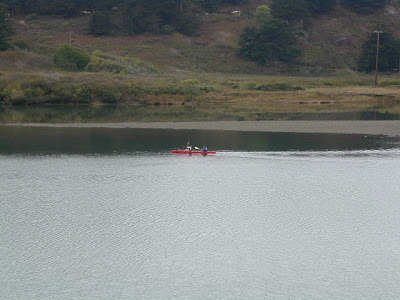 This is an excellent area for kayaking & camping. There are plenty small hotels for those wishing not to rough it. Redwood forests, coastal cafes, village shops, makes Gualala California a tourists destination along Highway 1. 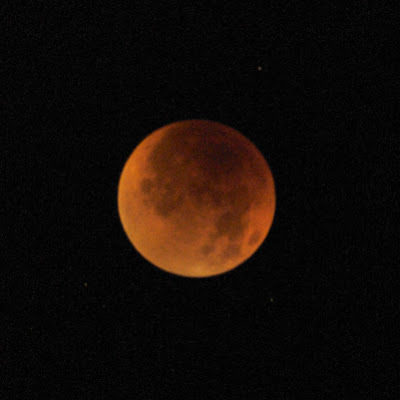 Hendy Woods State Park, Manchester State Park & Salt Point State Park are all close by. The County Park at Gualala Point is dog friendly & has camping too. California has the best beaches on the west coast & they draw millions of tourists here each year. 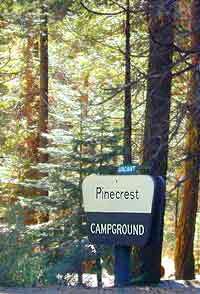 From RV camping on the beaches of San Diego to Northern California's rural Lost Coast, we have a variety of public & private Campgrounds along the coastline for every style of camping. 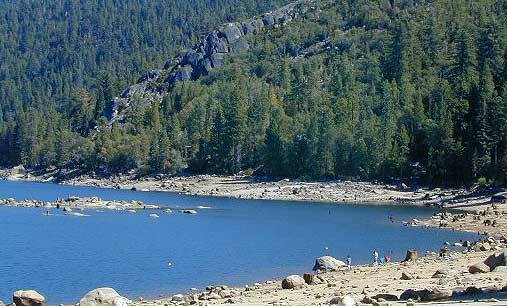 The best coast camping is along the scenic Central Coast of California, also known as Big Sur CA. A 100 mile stretch of natural beauty that spans from Carmel to Cayucos. Partington Cove is a great day hike with redwood forest & rocky coves; just north of Julia Pfeiffer State Park. 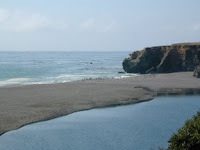 At the southern end of the Big Sur coast, Sand Dollar Beach is a great dog friendly beach w/ Plaskett Creek Campground is directly across the street. 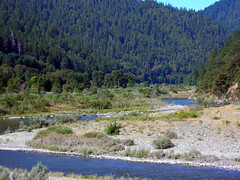 There are camp sites in: oak canyons, on dirt roads, on ridges, on rocky bluffs, or inside dense redwood groves. Primitive camping on ridges via forest dirt roads. Walk in camps at Andrew Molera, drive in RV camps at Big Sur State Park & backpacking in the Ventana Wilderness with awesome views of the coastline. Whether you seek a primitive, free camp site or a luxurious RV resort with all the amenities, Total Escape has all camping options listed on each destination page. This is a coastal paradise. Wide beaches, cliffs, views of the northern tip of Point Reyes. This coast can get foggy several months out of the year. One of those town names that sometimes gets misspelled (as Dillion Beach), has a big tourist following with surfers & RVers. 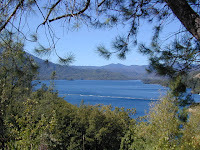 Private vacation homes, some for rent over look the Pacific Ocean & small resort down at the beach. 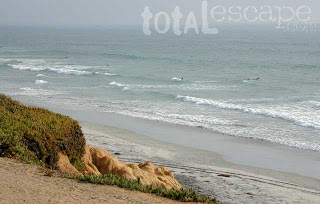 The beach is scenic, wide & often secluded for long walks. 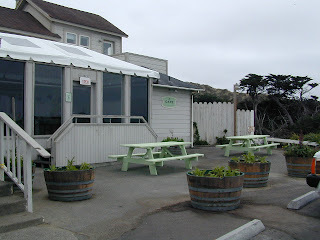 Dillon Beach California could be your next weekend get-away. 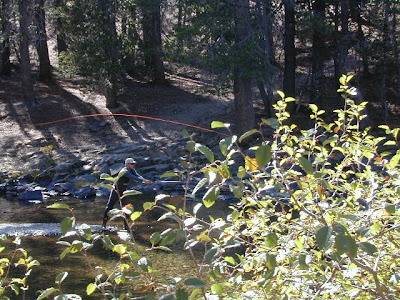 Eastern Sierra Camping: Twin Lakes, near Bridgeport California has some of the best fishing & camping in the Eastern Sierra region. The area gets buried in snow sometimes, but by late Spring the RVs start rolling in. 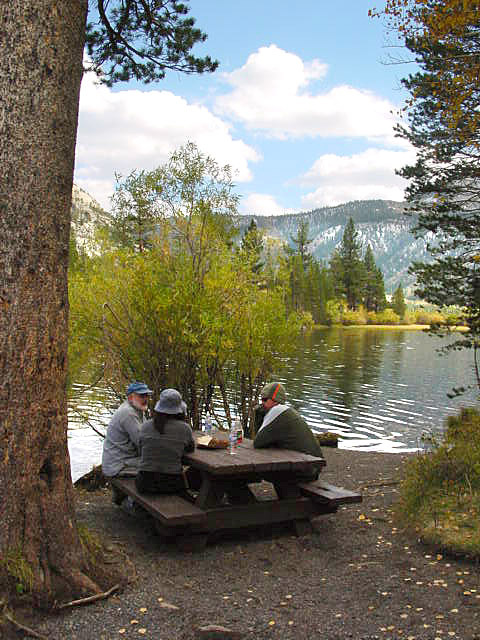 Campground reservations are recommended for mid-summer. Robinson Creek, Honeymoon Flat & Paha. 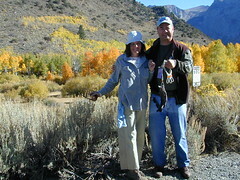 Buckeye Hot Springs, Hoover Wilderness trailheads, historic Bodie ghost town. The PCT is the 2650 mile national scenic hiking trail that stretches from Mexico to Canada & thousands of backpackers use it every year. 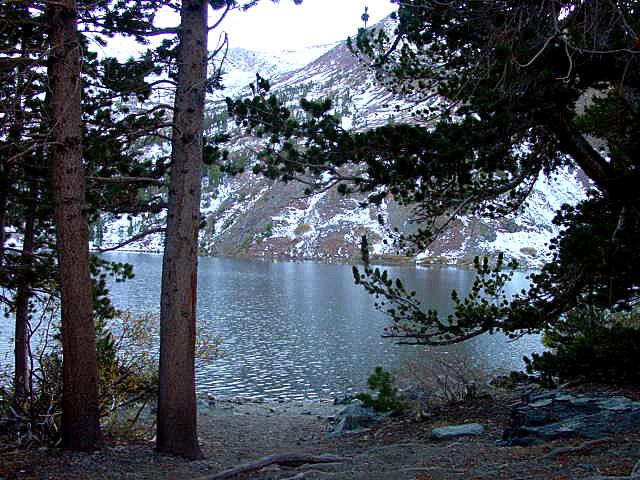 The Pacific Crest trail starts near Tecate & Campo California, heads north thru SoCal mountains & desert terrain, then up to Big Bear Lake. 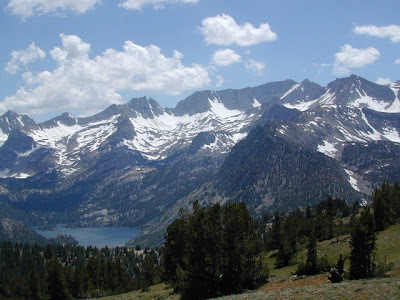 Eventually it'll end up in the High Sierra, the most majestic & desirable part of the journey. The newest waterproof maps are available for the whole stretch of the long journey. The PCT#1 covers SoCal & the PCT#2 map focuses on the area south of Tehachapi. The #3 deals with the Southern Sierra and so on, all the way north to Washington State and the Canadian border. If you're planning on hiking the whole thing, take more than a year off of work, get physically conditioned way ahead of time & start your research here.